An amazing athlete on AllAmericanGuys: Lorenzo is an aspiring fitness model and college graduate. He comes from the state of Georgia, although he spent some time in Florida (where he was scouted). Lorenzo is somewhat reserved yet pretty confident. He regrets not modeling at an earlier age, but with his looks and physique he'll most likely do just fine. He hopes to make it in a fitness magazine and land some lucrative campaigns. You find more high quality photos and videos with Lorenzo here on AllAmericanGuys. "On November 10th, I lost everything I owned (including my dog) in a house fire that was caused by an unknown heating problem. Before the fire, I moved to LA to pursue my modeling and acting career, not knowing anyone or having any family in LA, I was taking a leap of faith so that I can make my family proud. The night of the fire was one of the most devastating nights of my life thus far, it was the first chilly night so I turned on the heat went into the shower. When I came out of the bathroom, my bedroom was up in flames. Not knowing how to react I quickly began to try and put the fire out but it was too late. The heavy dark smoke was blinding and it made it hard to breathe. I was in such shock I couldn't react fast enough to grab my dog before he ran outside with no collar. The smoke finally got to me and I had to get out, watching everything I own and worked so hard for go up in flames in a matter of minutes. It is traumatizing. Having no home insurance I am at a loss for everything." Now a site has been put up with a Paypal link: www.jedhill.com. If you want to help, you can donate via www.Paypal.com under the email jedediahhill@gmail.com. Greg's 600 Workout is the 95th video available to GregPlitt.com members. "Why am I doing all this? I want to be at my best", Jamie says about his hard contest preparation. This video is not only about getting lean, it is an inspirational look at pre-competition dieting from FAME fitness model Jamie Barnard, taking us into the challenging few hours the night before competition when the body is dramatically affected by carb depletion and lack of water. This is all part of the techniques used by bodybuilders and fitness models to have their muscles looking at their best for the day of competition - but it's also one of the most challenging aspects of preparing for the stage. "My training for a competiton is very intense. I train four, five times a week", Jamie says. This video is an insight into the world of male fitness modelling from young British athlete, Jamie Barnard. Jamie placed second in the UK FAME competition in 2010, having made great improvements from his debut the previous year. Jamie is also a top personal trainer, based in Central London. Here, he talks about setting goals, his progress between competitions, and his plan for improving his physique. He is big, handsome, and now the new attraction on AllAmericanGuys. James is a former college football player, and currently bar tends and does modeling on the side. He is born and raised in Miami, Florida. James loves sports, the outdoors and partying it up in South Florida. You find a big number of high quality photos and videos with James here on AllAmericanGuys. Every muscle group of this young bodybuilder is big. Tomas Tabaciar from Slovakia has already succeeded at several competitions. It is exciting to see him working out intensely in the gym. You find two training videos and one posing video after the pictures. New CYM Model: Lubos C.
He has worked out intensely for his shootings for CzechYoungMuscle. 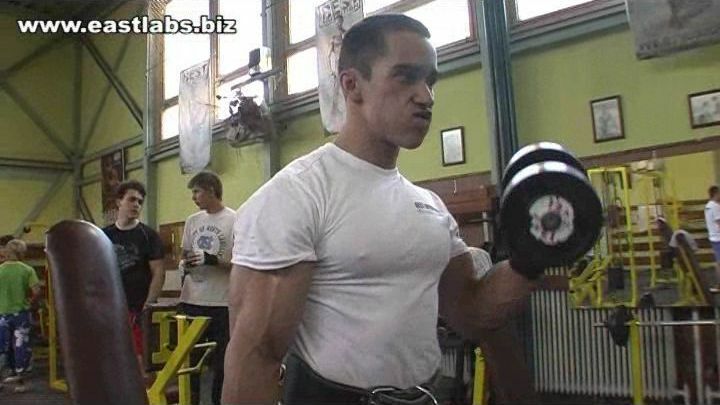 Now the first galleries and videos with Lubos C., junior bodybuilder and personal trainer, are published. Lubos started bodybuilding at home at the age of twelve, and has been training in the gym since he was fifteen. Two years later he participated at his first bodybuilding contest. In 2009 he won the Czech Juniors Bodybuilding Championship, in 2010 he placed first at the International Bodybuilding Contest in Prague. His goal: to succeed at world championships. You find many high quality photos and videos with Lubos C. here on CzechYoungMuscle. "It's not how you start, it's how you finish." This is one of Brandon's impressive mottos. A motto which explains his successful way to one of the best and most popular bodybuilders and fitness models in the world. Brandon's fitness journey began the day he picked up his first fitness magazine. 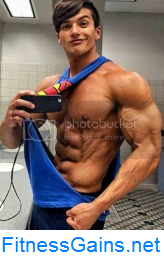 Even though he was on a championship baseball team he gave it up to follow his real dream of being the best natural bodybuilder/fitness model. At age 16, Brandon started reading every piece of literature he could get his hands on in regards to weight training, nutrition and supplementation. Staying up till 1, 2, even 3 in the morning was normal for him as he gradually built his knowledge base of the fitness industry. Brandon increased his knowledge base by consulting with other professionals in the fitness industry. After gaining substantial knowledge, Brandon was ready to apply it to his own regimen and step on the bodybuilding stage at age 18. Brandon didn't win the show, but learned the valuable lesson of perseverance, steady persistence in the pursuit of fitness. After his first show, Brandon decided he wanted to do this full time. He fell in love with the sport instantly. After countless bodybuilding shows, sponsorships, signing with the Wilhelmina modeling agency, overseas trips, magazine covers, and national certifications, Brandon still remembers his journey as the bright eyed kid with a dream, working out in his bedroom without a sense of direction, yet knowing this is what he was meant to do. And he announces, the best is yet to come. On his website www.BrandonBass.com he offers much information about himself, photo galleries, a store, and online training, especially one on one live video consultations and coaching. This is for competitive bodybuilders, aspiring fitness models and/or anyone looking to get into the best shape of their life. As a lifetime drug-free athlete, Brandon knows how much work, dedication and consistency that is required to build a championship physique and he will be with you every step of the way. Brandon is offering fitness consulting and guidance not only online but also in person. He runs his own independent personal training business in New York City and is available upon request.